← Bolivian Anthem rehearsed with Berklee College and Bolivian musicians at the Salt Flats of Uyuni! 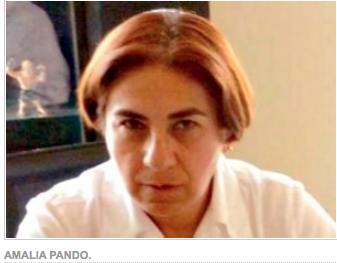 Under the coca grower leader, Bolivia endures lack of freedom of the press, Amalia Pando is the latest casualty! The journalist Amalia Pando announced her resignation from the leadership of a news program on Erbol, a Catholic radio in La Paz, which for a decade imprinted a questioning journalism style, analysis and reporting of abuse of power. “Because I want to facilitate the possibility of Erbol not sinking financially. I feel we are with water by the neck and above. I want to lighten the load of this ship. I know the government has repeatedly asked for my head, and then hand it over. See if Erbol is saved, which I think is a vital communication tool in this period and in any other,” she said to the newspaper El Deber. The station, like other media that defend editorial independence, is prevented from receiving government advertising, and journalist Pando realized that her resignation could help this media to recover income to avoid shutdown. In 2015, a total of five media, including the La Palabra newspaper from Beni, were fined up to $10,000 for the dissemination of news related to electoral information, prior to the election of local and regional authorities. Pando denounced in recent months, crimes of kidnapping, extortion and theft by prosecutors against humble people who attended the radio program of the journalist to reveal the abuses that so far were not prosecuted or punished. This entry was posted in Beni, Bolivia, Business, La Paz, Politics, Social Unrest and tagged corruption in public office, demagogue, ERBOL, freedom of expression, freedom of the press, public opinion, totalitarism. Bookmark the permalink.